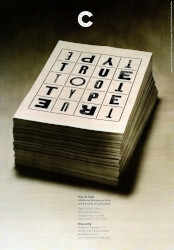 Poster for 'True to Type: Introducing letterpress printing and the works of small presses', a Crafts Council exhibition held at the Crafts Council Gallery, 44a Pentonville Road, London, from 7 July to 4 September 1994, then toured regionally until January 1996. Curated by Colin Banks, this exhibition showed the art kept alive by small presses and printers. The poster was designed by John Rushworth, Pentagram and printed by Penshurst Press. Logotype by Colin Banks and Alan Kitching. Photography by Giles Revell.